During these recent dog days of summer, when the temperatures have been reaching the mid to upper 90’s by early afternoon, I have been opting to go for my daily bike ride early in the morning rather than waiting for lunchtime. This deviation in my routine has allowed me to try out some breakfast spots that I had not been to before. 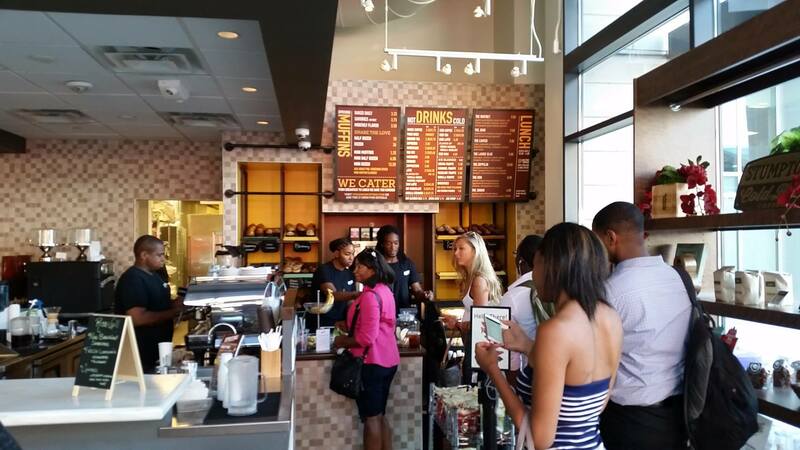 And one of these places has become one of my new favorite places – the Uprising Muffin Company – which is located at 1817 7th Street (MAP), just outside of the entrance to the Shaw/Howard U Metro station in northwest D.C.’s Shaw/Uptown neighborhood. 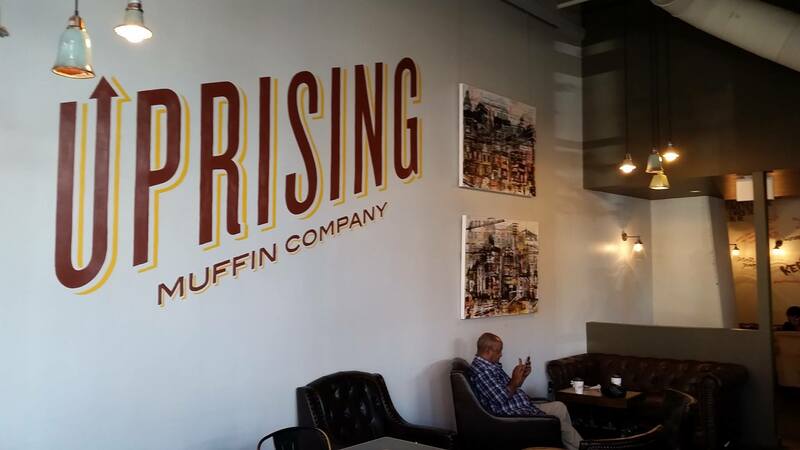 Uprising offers muffins on a rotating basis in almost three dozen different flavors. Every day they have some of the more commonly-found flavor selections, such as traditional Banana Walnut, Blueberry Streusel, and Chocolate Chip. By the way, you don’t have to wait until autumn to enjoy their delicious Pumpkin muffins, because they also offer daily and on a year round basis. Uprising also serves up some additional and unusual choices on a rotating basis throughout the week. These include Maple Pancake, Snickerdoodle, Strawberries and Cream, and Piña Colada. On top of that, they occasionally also offer seasonal selections, such as the delicious Peach Cobbler muffin that I sampled this morning. There are just too many varieties for me to list. So I guess you’ll just have to check them out for yourself, either in person or on their website. They also offer a couple of savory options, which are Uprising’s take on breakfast sandwiches. The Bacon, Egg and Cheese muffin and the Southwest Veggie muffin are available every day. But they are often available only in the morning because they sell out so quickly. 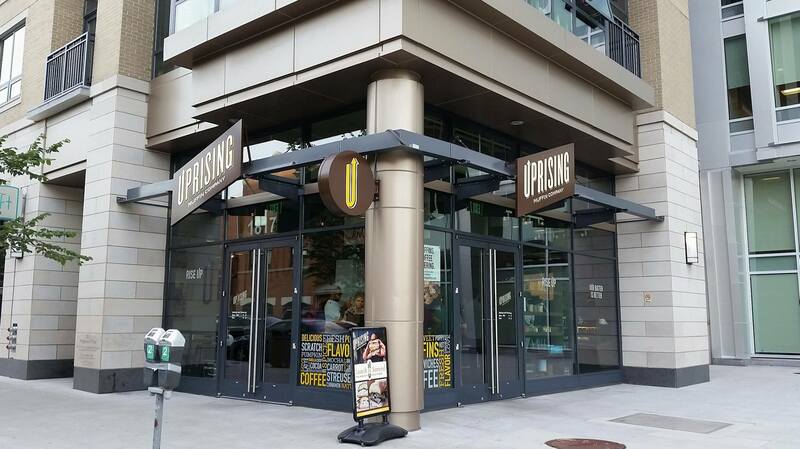 Uprising also features made-to-order signature sandwiches and fresh salads, along with coffee and espresso drinks featuring coffee from the Stumptown Coffee Company, which is roasted in small batches for freshness. Uprising was opened by Donnie Simpson, Jr., a former local radio industry employee and the son of the popular longtime WPGC radio host Donnie Simpson. And from the beginning it seemed to be an overnight success. 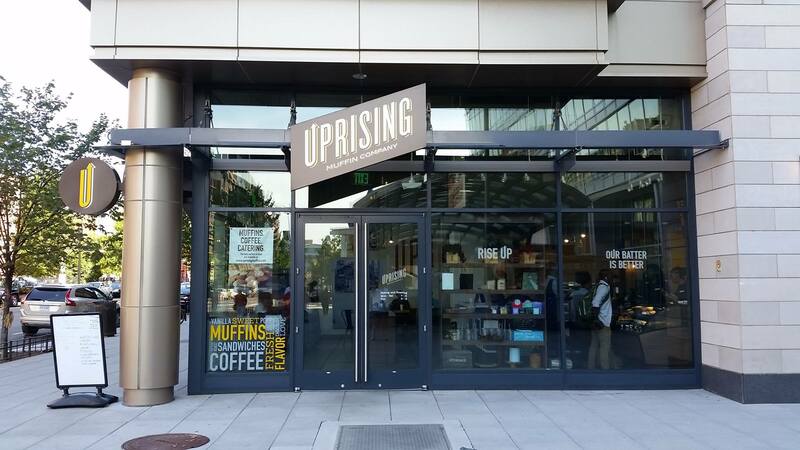 But Uprising was actually four years in the making by the first-time restaurateur. And taking the time to make sure they would get it right is evident in the quality of their muffins and other offerings. Every muffin they make starts from scratch and always contain 10 ingredients or less, which are obtained locally whenever possible. And what does go into their muffins is almost as important as what doesn’t. What doesn’t go into Uprising muffins are preservatives, artificial colors, or anything the average customer can’t pronounce. One of the best things about Uprising muffins aside from their deliciousness is their consistent freshness. And you can be assured that they are always fresh because at the end of each day they take any unsold muffins and donated them to the less fortunate in the local community. Then the next morning they make more muffins, which are always simple, fresh, delicious, and ready to join or maybe even replace cupcakes and doughnuts as a local pastry favorite.